How to write a Bank Risk Analyst Resume template? 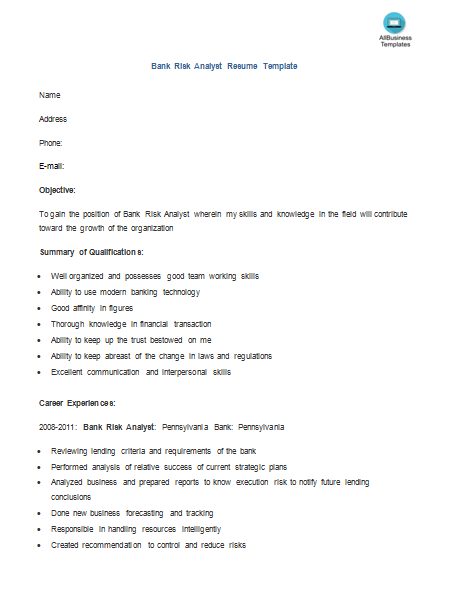 An easy way to start is to download this Bank Risk Analyst Resume template now! Every person seeking employment in the banking industry can make use of Free Banking Resume templates to enhance their chances of landing the job. This is because top free templates help you get the idea of structuring your banking resume samples operations, which eventually will help create interest to the prospective employer. They not only save you time as you do not have to start from scratch when drafting your retail banking resume but also help you to create a long lasting impression to your prospective employer as mistakes are minimal. Finding a template tailored to your needs can prove to be a challenge as very few of these available around you. Now we provide this standardized Bank Risk Analyst Resume template with text and formatting to help you finish your document faster. If time or quality is of the essence, this ready-made template can help you to save time and to focus on what really matters! It comes in Microsoft Office format, is ready to be tailored to your personal needs. Completing your file has never been easier! This template will perfectly suit your needs!